After learning about the life and works of Paul Cezanne, the children make still-life paintings using his style. For ages 9 to 13. Plan 3 sessions. Look here for more information about Paul Cezanne. Click here and scroll down to see four examples of Cezanne's still-life paintings. Paul Cezanne was one of the most influential artists of the 19th century. As a forerunner of modern art, his work bridged the Impressionist style of painting the effects of light and the Cubist style of seeing objects in planes of color. 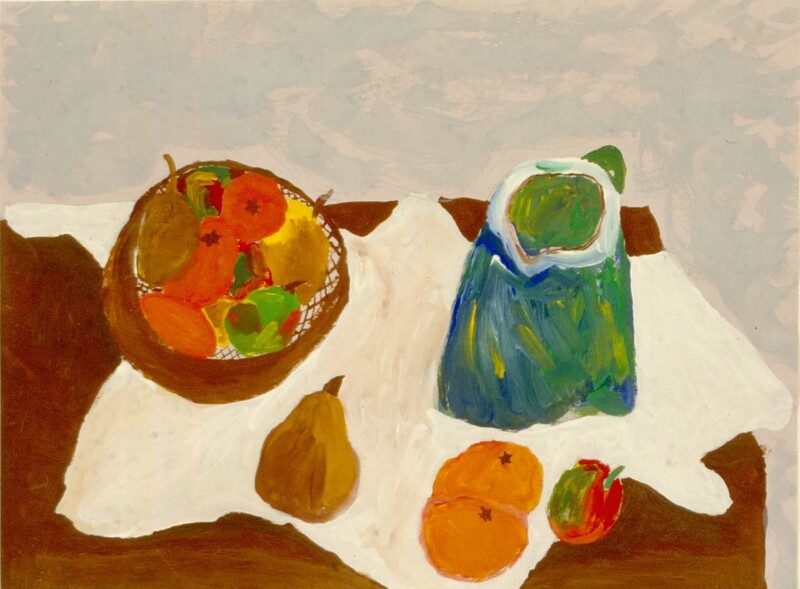 An inspiration to artists like Picasso, Braque, and Matisse, his achievements in painting would be varied and perfected by many generations of painters to follow. Born in 1839 in Aix-en-Provence (ex-on-provense) in southern France, Cezanne grew up with two younger sisters, Marie and Rose. He loved to swim, write poetry, play the cornet, and roam the countryside. At ten years old he was already studying art, but his father, a wealthy banker, encouraged him to become a lawyer. Cezanne attended law school for two years before deciding he really wanted to be a painter. At 23, he moved to Paris to further his study of art. Working with the Impressionists, he began using lighter and brighter colors, but he was less interested in their use of reflected light and began to explore structures in nature, using different colors to show different planes in objects. 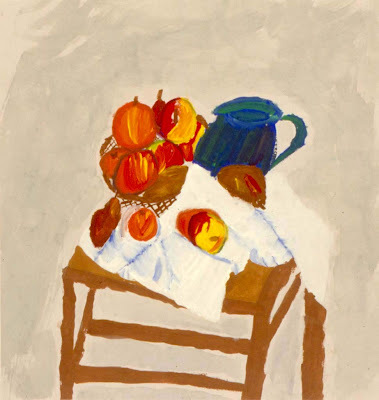 For example, in his still-life paintings, apples are not just red – they are red, orange, yellow, and green. Cezanne believed that artists have the right to change the shapes of objects and rearrange them on the canvas, or even tilt a table top, in a way that could not exist in nature. He said, “I am the beginning of the way I have discovered,” understanding that his style of painting was a first step in the development of modern art in the 20th century. Cezanne died in 1906 at the age of 67. Become familiar with the life and paintings of Paul Cezanne. Make a still-life arrangement of fruit that can be easily seen by all the children. Set out paper and drawing pencils. Gather examples of Cezanne’s still-life paintings. Tell the children about the life and works of Paul Cezanne while sharing the examples of his paintings. 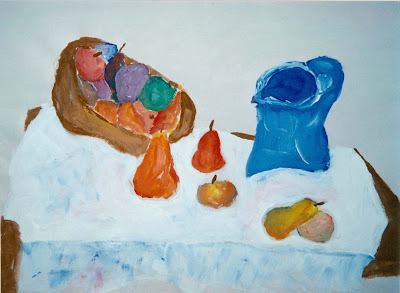 Explain that they will be using Cezanne’s style to make still-life paintings, or paintings of inanimate objects. In this session, they will use pencils to draw the objects on their papers, making arrangements that they will paint in the next session. Looking carefully at the still-life arrangement, discuss how Cezanne chose which objects he wanted to include and then positioned them wherever he wanted in his paintings; used different colors within each object to show its planes, or flat surfaces; gave unnatural slants to the table tops; and made brushstrokes that follow the movement of the drapery to show its folds. Have the children lightly sketch their arrangements on the paper, choosing which objects to include and where to place them. They should draw only the contour lines, or outside edges, of the objects. Explain that any pencil-drawn details will disappear when the paint is added in the next session. Note: Store the fruit in a refrigerator until the next session. Set out the still-life arrangement and drawings from the previous session. Set out paints, brushes, containers of water, mixing trays, and sponges. Explain that in this session the children will be painting their still-life arrangements. Before they begin, review the basic points of Cezanne’s style. Show the children how to lift dollops or puddles of paint onto the mixing trays with their brushes before mixing the colors together. 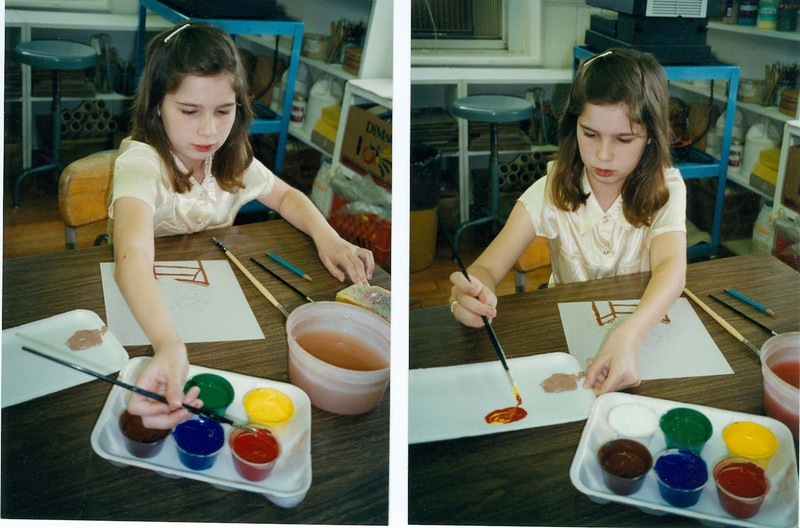 This will avoid watery colors that have been scrubbed onto the paper due to mixing too little paint to cover the area. Demonstrate how to paint the drapery by using brush strokes that follow the movement of the folds. Lines of a darker color of paint can be blended in where the shadows fall. When children paint the background, they often cover over the objects in the paintings. They can avoid this by leaving a small, unpainted section between the objects and the background color. Have the children paint their arrangements, encouraging them to define planes on the objects with color and to fill their whole paper including the background with paint. Even though the children will decide on the placement of the objects in their paintings, be sure to set up the still-life arrangement the same in each session. Apples, oranges, and pears work well in the arrangement because their shapes are familiar to children and they will keep well in a refrigerator between sessions. Have the children discuss the characteristics of Cezanne’s paintings that led to modern art. Point out where the children used colors to define the different planes in the objects. Discuss with the children how they felt while using Cezanne’s style of painting. Do I have to include the basket? The cloth in my painting looks like a flat piece of paper. I like the color of my paper, so do I have to paint the background? 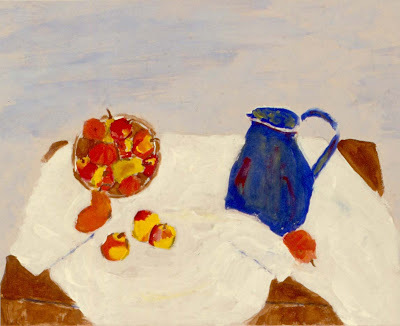 Like Cezanne, you can decide which items to include in you painting and where to place them. Don’t forget that you can paint the folds in your drape by blending in a darker color where the shadows fall. In order to give your painting an even texture and a finished look, you will need to cover your whole paper with at least one layer of paint.